Seven summers ago, Marcella Atkinson fell in love with Cecil McClatchey, a married father of two. But on the same night their romance abruptly ended, Cecil’s wife was found murdered—and their lives changed forever. The case was never solved, and Cecil died soon after, an uncharged suspect. Now divorced and estranged from her only daughter, Marcella lives alone, mired in grief and guilt. Meanwhile, Cecil’s grown son, Jed, returns to the Cape with his sister for the first time in years. One day he finds a woman’s bathing suit buried in a closet—a relic, unbeknownst to him, of his father’s affair—and, on a hunch, confronts Marcella. 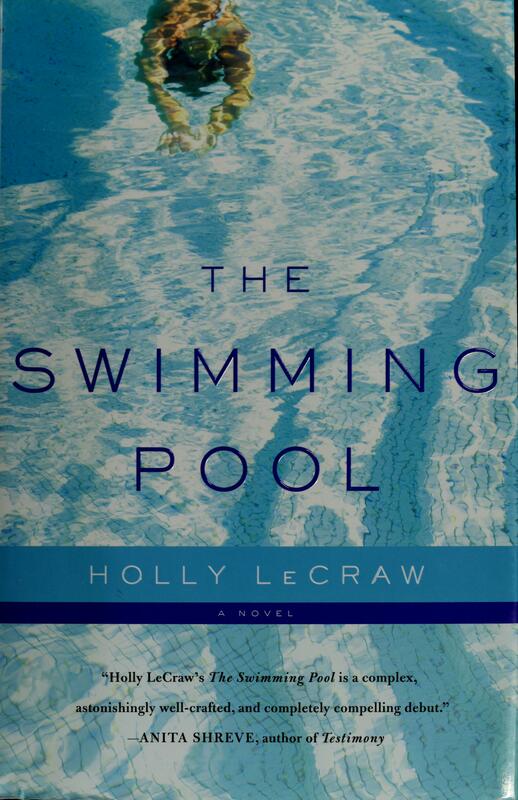 When they fall into an affair of their own, their passion temporarily masks the pain of the past, but also leads to crises and revelations they never could have imagined.In what is sure to be the debut of the season, The Swimming Pool delivers a sensuous narrative of such force and depth that you won’t be able to put it down. Holly LeCraw lives outside of Boston with her husband, who is a journalist, and three kids. Her short fiction and book reviews have appeared in a range of publications, including the Edge City Review and the Boston Book Review. Her short fiction was nominated for a Pushcart Prize. Though a newcomer as a novelist, she grew up in the book industry. What are all the different forces that draw Jed and Marcella together? What taboos, exactly, are they breaking? What fruits does this relationship bear—and are they worth the transgression? What do you think Jed and Callie might have been like if their parents hadn’t died? What do you think it did to them losing their parents just as they were about to become adults themselves—how would that be different from other timing? Marcella begins the book as a very broken and fragile woman. How long has she been like this? What has contributed to it, besides her divorce and Cecil’s death, and to what degree? What is her progression throughout the book—does she end up in a different psychological and emotional place? What are the signs that she might have changed? The cocktail party at the McClatcheys’ pool becomes a centerpiece: at different points we see it from Jed’s, Callie’s, Anthony’s, Cecil’s, and Marcella’s POVs. How did such a mundane event become so central? What did that day mean for all these different characters? Discuss why all of them were so vulnerable at those particular times. What might Toni’s and Betsy’s perspectives—the only missing ones—have been like? Why do you think LeCraw uses different points of view? Why might she choose a particular POV for a scene? How would the book be different if it were only from, say, Jed’s point of view, or some other character’s? Do you think Marcella and Anthony will get back together? Does Marcella still love him? How and why? What sort of man should Marcella have married? How might her life have been different–or would it have been? What sort of woman should Anthony have married? Or did they marry the right people after all? LeCraw often documents action not as it is happening, but as a character is remembering it. How does the memory add an extra layer of meaning to the action? Why do you think particular flashbacks are interwoven at the points they are? Discuss Callie and Betsy’s relationship—does it seem smooth? How does the nature of their relationship affect Callie’s grief process after Betsy’s death? What is your prognosis for Callie and Billy’s marriage? Do you think Callie will change as a result of her postpartum depression? (spoiler) How culpable is Anthony in Betsy’s death? In the end, how does it affect the reader’s experience of the novel and understanding of the characters to know or not know for sure? (spoiler) How do you feel about Anthony and Marcella’s decision not to tell Jed what they know? At the close of the book, do you think they will keep their secret? Why or why not? What might happen either way?